The faithful of Saint Andrew Orthodox Church in Dix Hills NY celebrated the patronal feast of their temple’s heavenly protector, the Holy Apostle Andrew "the First-Called," on 29-30 November 2013. The feast was truly joyous as many visiting friends joined parishioners and Father John Klingel (parish rector) gathered around their Archpastor, Bishop Michael. The services proved to be a feast of faith, spiritually enriching all those who took time from their busy Thanksgiving Day weekend to offer true thanksgiving to Our Lord and His first-called apostle, Andrew. The parish’s celebration of its patronal feast had fallen on hard times in the past. But, as a small sign of the renewal we see all across the diocese, by the Grace of God and with the constant encouragement and presence of our beloved Bishop Michael it has begun to flourish again. 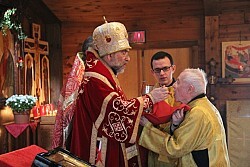 This year marked the first time in nearly a decade the parish was able to celebrate the feast-day as it is appointed to be served, with a Vigil on the eve and the Divine Liturgy on the day of the feast. It was a great joy for the choir to join with visiting singers to reacquaint the parish with the beautiful hymnography celebrating Saint Andrew, particularly during the festal Matins of the Vigil service. The festive meals shared after the services allowed everyone to continue in joy and fellowship throughout the weekend. The parish is deeply grateful to Bishop Michael for his ministry, presence, patience, and prayers with the community on this occasion. Likewise, the parish extends its gratitude to Father Seraphim Joa, Father John and Matushka Doreen Bartholomew, Father Nathan Preston, Subdeacon David Lucs, Reader Robert and Kamelia Sirico, all of their guests, and those who helped organize the services, reception, and beautiful dinner. The parish anticipates joining together in unity again, with the extended Orthodox community on Long Island, for the feast-day of Theophany (6 January). On that occasion they will join Bishop Michael in blessing the waters of the Island’s Great South Bay and, beyond, the Atlantic Ocean.